I've been so busy with my latest project that I haven't been posting. Not that I was posting much even before that... but I love to be busy and there it is. However I would like to share this home with you and the owners, L and B, have graciously agreed to let me document this gut renovation. 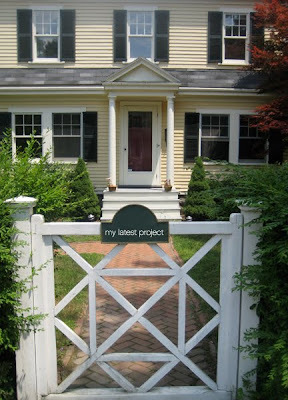 I feel very fortunate that my own architect, Jeff Yates, recommended me for this project. He is the rare architect (and I come from a family of them so I know...) who is completely devoid of a strong ego. He is not only a wonderful designer, with a lovely, flowing sense of space, but he's open to ideas. Anyway, he saw my passion for this work on my own house, my experience from Pottery Barn... and voila! A new chapter in my design career. This house is a total gut renovation. It's a charming, cottage-y Dutch Colonial with a gambrel roof that was built in the 1920s here in Concord, Massachusetts. Unfortunately, previous owners had a few too many wine coolers in the 80s and built this entryway and family room on the back. Stay tuned for gorgeous inspiration photos... even though the house isn't huge we're touching almost every room. Five bathrooms, kitchen, entryways, dining room... it's going to be amazing! We're almost done with demo and framing, so we're kicking into high gear. And stay tuned for an update to my website... a new career is an excuse for a new look! Congratulations on this new project! Can't wait to follow along! Was just through Concord two days ago.... love your town! No, it's not really huge. It's very cottage-y so the ceilings aren't really high and the rooms are modestly sized. You'll see. But the number of bathrooms is a bit overwhelming. I was in Visual Merchandising at Pottery Barn Kids... We were in charge of all the retail stores. But my group also did photoshoots, graphic design, etc. - every bit of paper you might pick up in the stores we touched! I loved my "big boss" who is now the President of Pottery Barn - Sandra Stangl. She had a great eye and we worked together so well. Looks like a fun thing, starting from scratch is great. A clean slate too. I know that re fixing houses is a lot of work but it most be very gratifying.